"This finding is a crucial new piece of evidence showing that environmental conditions favorable to the emergence of life can be sustained on icy bodies orbiting gas giant planets." Nicolas Altobelli, the European Space Agency's project scientist for Cassini. NASA's Cassini spacecraft has discovered the best evidence yet for a large-scale saltwater reservoir beneath the icy crust of Saturn's moon Enceladus. The data came from the spacecraft's direct analysis of salt-rich ice grains close to the jets ejected from the moon. Data from Cassini's cosmic dust analyzer show the grains expelled from fissures, known as tiger stripes, are relatively small and predominantly low in salt far away from the moon. But closer to the moon's surface, Cassini found that relatively large grains rich with sodium and potassium dominate the plumes. The salt-rich particles have an "ocean-like" composition and indicate that most, if not all, of the expelled ice and water vapor comes from the evaporation of liquid salt water. The findings appear in this week's issue of the journal Nature. "There currently is no plausible way to produce a steady outflow of salt-rich grains from solid ice across all the tiger stripes other than salt water under Enceladus's icy surface," said Frank Postberg, a Cassini team scientist at the University of Heidelberg, Germany, and the lead author on the paper. When water freezes, the salt is squeezed out, leaving pure water ice behind. If the plumes emanated from ice, they should have very little salt in them. 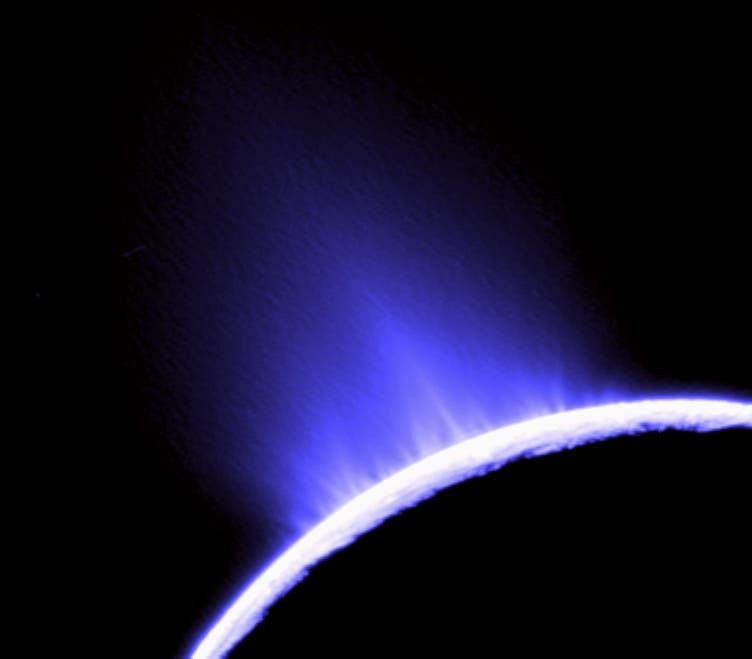 The Cassini mission discovered Enceladus' water-vapor and ice jets in 2005. In 2009, scientists working with the cosmic dust analyzer examined some sodium salts found in ice grains of Saturn's E ring, the outermost ring that gets its material primarily from Enceladean jets. But the link to subsurface salt water was not definitive. The new paper analyzes three Enceladus flybys in 2008 and 2009 with the same instrument, focusing on the composition of freshly ejected plume grains. The icy particles hit the detector target at speeds between 15,000 and 39,000 mph (23,000 and 63,000 kilometers per hour), vaporizing instantly. Electrical fields inside the cosmic dust analyzer separated the various constituents of the impact cloud. The data suggest a layer of water between the moon's rocky core and its icy mantle, possibly as deep as about 50 miles (80 kilometers) beneath the surface. As this water washes against the rocks, it dissolves salt compounds and rises through fractures in the overlying ice to form reserves nearer the surface. If the outermost layer cracks open, the decrease in pressure from these reserves to space causes a plume to shoot out. Roughly 400 pounds (200 kilograms) of water vapor is lost every second in the plumes, with smaller amounts being lost as ice grains. The team calculates the water reserves must have large evaporating surfaces, or they would freeze easily and stop the plumes. Cassini's ultraviolet imaging spectrograph also recently obtained complementary results that support the presence of a subsurface ocean. A team of Cassini researchers led by Candice Hansen of the Planetary Science Institute in Tucson, Ariz., measured gas shooting out of distinct jets originating in the moon's south polar region at five to eight times the speed of sound, several times faster than previously measured. These observations of distinct jets, from a 2010 flyby, are consistent with results showing a difference in composition of ice grains close to the moon's surface and those that made it out to the E ring. That paper was published in the June 9 issue of Geophysical Research Letters. "Without an orbiter like Cassini to fly close to Saturn and its moons — to taste salt and feel the bombardment of ice grains — scientists would never have known how interesting these outer solar system worlds are," said Linda Spilker, NASA's Cassini project scientist at the Jet Propulsion Laboratory in Pasadena, Calif. The Cassini-Huygens mission is a cooperative project of NASA, the European Space Agency and the Italian Space Agency. The mission is managed by JPL for NASA's Science Mission Directorate in Washington. JPL is a division of the California Institute of Technology, Pasadena.